Grant Forrest, the current star of Lothians amateur golf, beat one of his predecessors, Euan McIntosh, to win the Battle Trophy at Crail. McIntosh flew the Turnhouse flag when he represented Scotland in the 1989 Home Internationals, having come through the ranks just ahead of Stephen Gallacher. Now 47, McIntosh is currently based in Dubai, where he plays his golf at The Els Club, but he turned back the clock over two testing days on the Fife coast. With rounds of 73, 70, 73 and 75 on the Craighead Links, McIntosh matched Forrest’s three-over-par 291 total after the Craigielaw player signed for scores of 73, 72, 72 and 74. It left the pair going head-to-head in a sudden-death play-off, with Forrest claiming victory in the Scottish Golf Order of Merit event thanks to a birdie at the first extra hole. 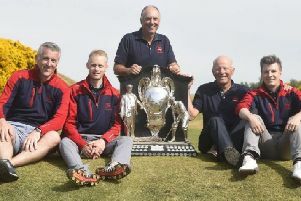 “It’s great to again win an individual trophy as it’s been a long time since my St Andrews Links trophy win,” said Forrest of his last individual triumph in 2014. “I struggled with my game last year and it’s just good to get back on track with a victory. McIntosh was left to rue a poor 3-wood tee-shot in the play-off, but it was a terrific effort nonetheless against a player almost half his age. “This is a young man’s game as after playing four rounds in two days, and then an extra hole, I am exhausted,” he said. “I am also used to playing in 32 degree Celsius weather with no wind, as it was so tough out there over the weekend. “And I just don’t know what happened to my tee shot in the play-off as I tried to cut a 3-wood and just lost it.